It is true that a greater percentage of calories burned will come from fat if exercising at a low intensity. However, because you're exercising at a lower intensity, you will burn less total calories. On the contrary, if you do a harder, higher intensity activity, like sprinting on a track, or a bike, you'll burn an overall greater amount of calories. Another benefit is the "metabolic" effect... Whenever you begin exercising your metabolism speeds up, and then it slows back when you finish. But with interval training, your metabolism remains elevated, sometimes for as long as 24 hours; so you're burning fat all day! The same cannot be said for aerobics - once you stop, your body returns to your normal resting metabolism. Intervals also protect your muscles so you don't use them for fuel. This type of training drives your muscles to exert a lot of force. Sprinting can be done on a stationary bicycle, a stair stepper, or any activity where you can alternate periods of high intensity with periods of low intensity. Sprinting also increases citrate synthase, an enzyme that is indicative of the tissue's ability to utilize oxygen. 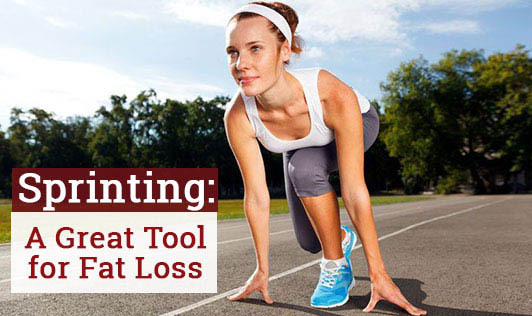 Sprinting is a great tool to help in fat loss, kill stress as well as increase your metabolic rate for days. On top of all this, it's a great exercise for your hamstrings and can help sculpt and tone those muscles you would kill to have.